I don’t know about you, but sometimes getting a healthy dinner on the table can feel absolutely daunting. Some days the only thing keeping me from ordering takeout is the sad vegetable drawer in my fridge staring me right in the face, saying “Eat me! Cook me! I swear it will be worth it!” “Please don’t leave me here to waste away and DIE!". These sheet pan chicken kabobs not only save my produce from being buried in the compost for all eternity, but they come together quickly and with minimal cleanup. No skewers, no grill, one pan, easy peasy. This recipe features my tahini yogurt dressing, where the dressing doubles up as a marinade and a finishing sauce. The dressing adds loads of flavor as well as tenderizes the chicken, keeping it juicy, even after a scorching under the broiler. 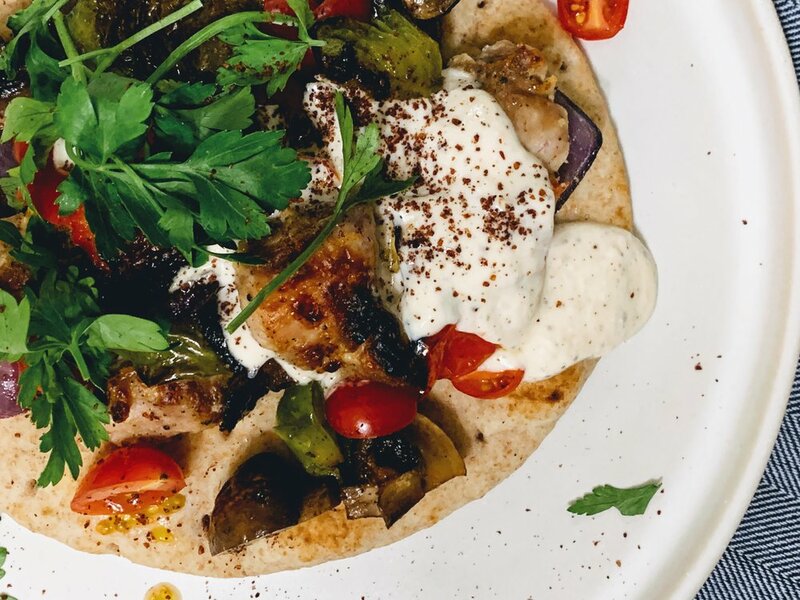 Throw in some blistered peppers, onions, and mushrooms, throw it on top of soft pita bread, and voila!, a perfect weeknight meal. Your wallet, crisper drawer, and whoever does the dishes in your house will thank you. In a large bowl, season the chicken with 1/2 tsp of kosher salt and a few grinds of pepper. Add the tahini yogurt dressing, stirring to coat, and let marinate at room temperature for 30 minutes. Preheat oven to 350 degrees. On a large sheet pan toss vegetables with olive oil, remaining 1/2 tsp kosher salt, and a few grinds of pepper until evenly coated. Once the chicken has marinated for 30 minutes, add it to the sheet pan, and roast for 15 minutes. Finish the chicken and vegetables under the broiler on high for 10 minutes, stirring halfway through. Keep a close eye on things while it is under the broiler. Your kabobs can go from lightly charred to charcoal in seconds. Remove from oven and squeeze a half a lemon over the top of everything. Serve with fresh pita, sliced tomatoes, more tahini yogurt dressing, parsley, and sumac.